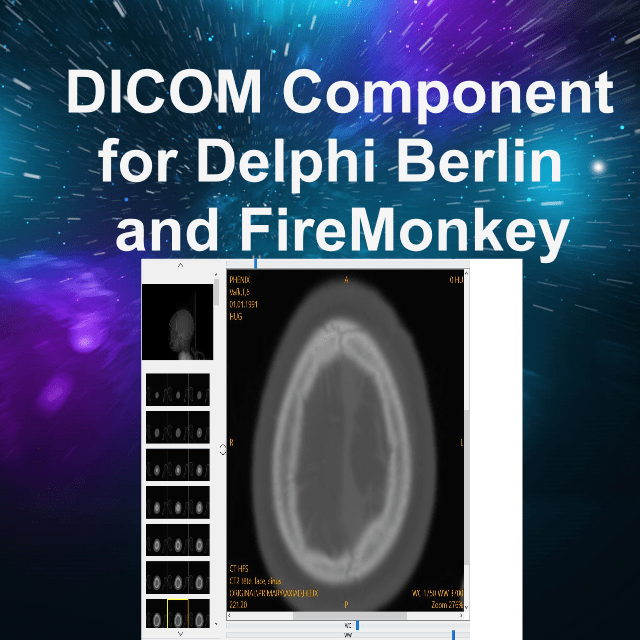 Developer MedicalEffect has a DICOM component now available for FireMonkey in Delphi 10 Berlin which gives you the possibility to build powerful medical applications. DICOM (Digital Imaging and Communications in Medicine) is a standard for handling, storing, printing, and transmitting information in medical imaging. It includes a file format definition and a network communications protocol. The component is written in Object Pascal, no other files or libraries are required to deploy with your application and it follows the latest DICOM standard (DICOM 3.5). It supports Windows, OS X, Android and IOS and it comes with an integrated DICOM viewer and communication interface. The component is not free, various licensing options are available: from single developer license (the cheapest and most convenient) to site license with source code. After purchasing, you can include this component in your applications at no other costs. Free trial version is available and it includes demos for all platforms (DICOM viewer, DICOM server). Also, it has DIMSE-C (PACS/DICOM Server) in case you have many medical devices and you require a centralized solution to manage them all. Also it has up to date documentation and manual which gives you easy and fast integration. Head over to check out the full features of this component for FireMonkey in Delphi 10 Berlin. How Do I Get and Evaluate Medical Digital Imaging Component For FireMonkey In Delphi 10 Berlin On Android And IOS?